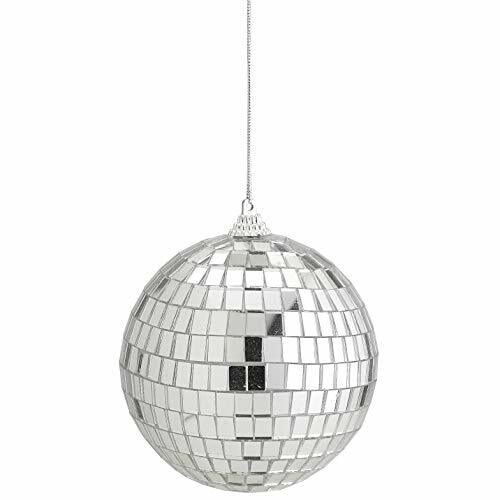 Eliminator Lighting EM12 mirror ball (12" Em-12) solid core mirror ball with safety hanging hook secured through the ball for confidence that the hook will not pull out of the ball. Searching for elegant decal balls for your upcoming occasions and events? Well, the search is over!Do not miss Kicko's phenomenal and exquisite disco balls that perfectly produce entertaining light touches and reflections. They are super magnificent and highly visible shooting effects and backdrops during stage plays, theatrical shows, or accents in photo booths.Eye-catching, non-irritating, and will give you real discotheque feel as it gracefully dances and reflects on the walls and floors. Creating different random illumination strokes when collided with luminosity. Hassle-free to setup because you only need to find a great spot to hang it using the string or add it as your decorative ornament and achieve a pleasing and lively atmosphere around your place.Perfect adornments for incoming Weddings, Family Gatherings, Bashes, Debuts, or themed celebrations like Snowy Christmas and white motif parties. Truly shows-off and attention-getting for guests and visitors.Do not miss the opportunity to host a party that will become very unforgettable and classy. Grab yours now! 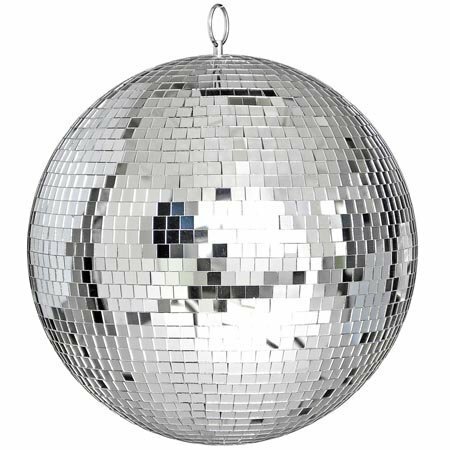 16" Mirror Ball contains 100s of reflective mini panels, expect a brilliant reflection to be projected onto every square inch of the dance floor. 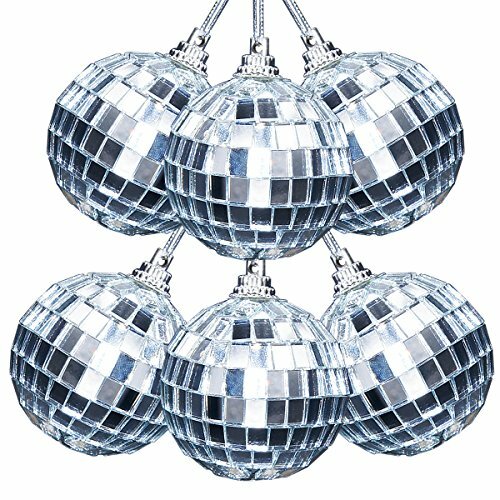 Disco Balls Silver mirror finish。 This product USES the principle of light reflection, The colorful lights of the stage, bar, dance floor, DISCO, DISCO, and other places are reflected by the countless mirrors on the surface of the mirror surface. It's the equivalent of copying the light and projecting it to a more vibrant and dynamic lighting effect. Here is the Brand New 6RPM Rotating Mirror Ball Electric Motor with 4 Colors LED Lights. 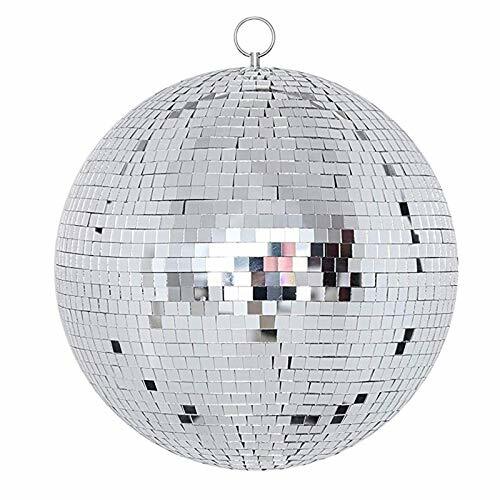 Great for 6" 8" 12" Disco Mirror Ball. Mounts to the ceiling with srcews and works great with disco ball as the LED lights of motor rotating. Perfect for DJs, Bands, Pubs, Weddings, Banquets, Night Clubs, Discos or any other occasion for providing a gleaming and breathtaking atmosphere!Features:- 2 Mode: Mode 1: LED Lighting and Rotating Mode 2 : Shinning with Voice-activated LED Lights and Rotating- The capacity: Using Hanger of the Motor: 4.5 lbs Mounting to the Ceiling : 13.2 lbs- Batteries Required 2 AA Batteries(Not Included)Package Contents:- 1x Motor- 1x Hanging Chain** Tips: Suggest mount the motor to the ceiling for safe use with 4x16# tapping screws(not included). This is the incredible LED Peak Due Rotating Mirror Disco Ball with beautiful patterns in running motion. Rotating mirror ball with high reflection mirror tiles. Two adjustable multi-color LED spot lights. Great for house parties, concert venues, karaoke, dance halls, nightclubs, discos , bars, family gatherings and even children's rooms. Two adjustable multi-color LED spot lights. Powerful LEDs are integrated into the base. No Installation Required - Simply Plug and Play. Your Personal Disco Light. Rotating mirror ball with high reflection mirror tiles. 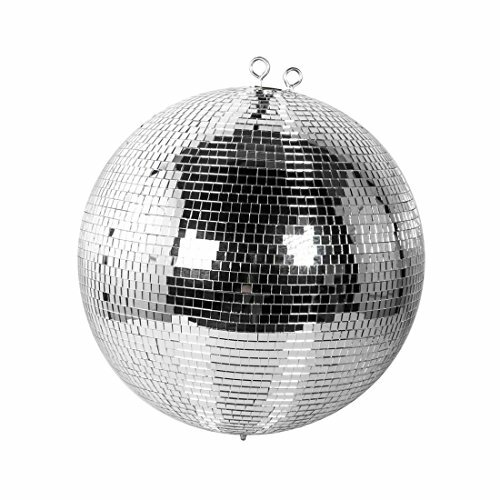 Create your own amazing ball or party with this 12" Mirror Disco Ball Combo Kit!! All included - the mirror ball, the pin spot, the motor!! Just get it and have fun!!! Bring a taste of disco era or create a contemporary festivity with this complete ball kit! Features: *Pin Spot Light: ** Rated Lifespan: 50000 hours **2-1/16" Dia. 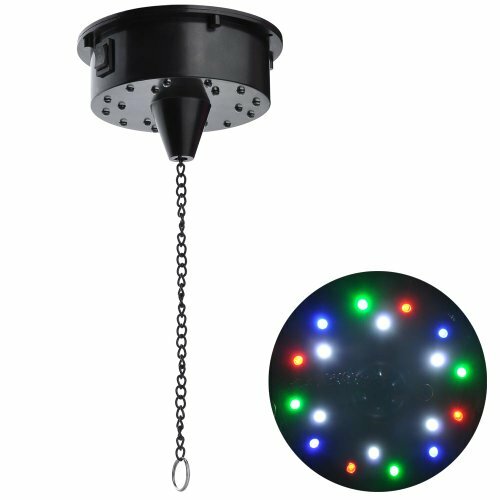 Surface **53" Long Power Cord **Hanging Bracket for Mounting to the Ceiling *Motor w 4 Color LEDs: **110V/60Hz, 54mA, 1.5W **6 RPM Mirror Ball Motor w/ Battery Box **18 LED Lights( Green / Red / Blue / White) **2 Mode: Mode1: LED Lighting and Rotating and Mode 2: Shinning w/ Voice-activated LED Lights and Rotating **The capacity: Using Hanger of the Motor: 4.5 lbs and Mounting to the Ceiling : 13.2 lbs **Batteries Required 2 AA Batteries( Not Included) **Power Cord Length: 73-1/2" Package Contents: *1 x 12" Mirror Ball *1 x Pin Spot *1 x Motor **Tips: Suggest mount the motor to the ceiling for safe use with 4x16# tapping screws (not included). Get the party started anywhere and anytime with these funky fun disco ball string LED lights. These shiny mirror ball string lights will turn any room into a party room with their groovy glow and glimmer. 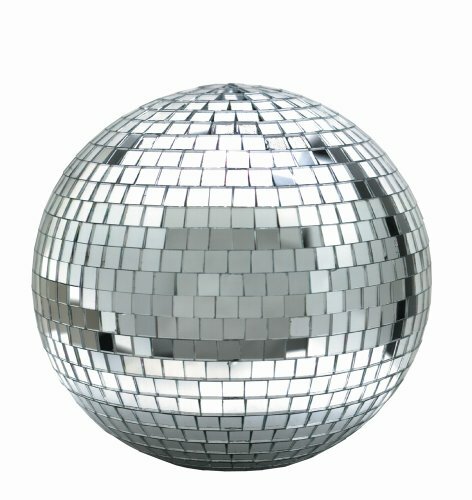 Add a little funk to your ride, some boogie to your bedroom, or jazz up your locker by draping and swathing your space with these glowing glitters.Each mirror embellished disco ball contains warm white LED that will reflect room light in that classic disco pattern, adding peppy playfulness into your ambiance. This set of 10 LED illuminated mirror disco balls is powered by two AA batteries, making it perfectly portable. These fun lights are an easy way to add attitude and an atmosphere of fun to any space. 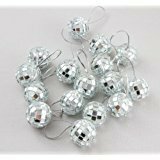 Take them with you, wherever groove is needed most, simply hang them up, and let the Mirror Ball String Lights bring the party to you!